What are focused plans for coaches worth? What is player loyalty worth? What is improved player development worth? Our curriculum does not purport to be the only curriculum available to coaches but it does claim to be the most direct and logical. It doesn't come packed with game and drill ideas because by and large, coaches already have a plethora of those up their sleeves. Our curriculum is designed to ensure that students can progress naturally with the necessary skills, movements and tactical understanding so that they do not reach higher levels of competition with glaring omissions in their game. Understandably, the coach will be the one responsible for assessing what stage a player is at based on the outcomes identified in the curriculum. Thankfully, an assessment literally takes less than 30 seconds to complete and lodged to us. It can be done on a computer or smartphone, or it can be completed on one of the provided assessment guides and sent manually. It does not require sensitive information or contacts for students or parents. All communication is conducted between FourCoach and the tennis coach/centre. This service costs around 45 cents per player per week. We understand that for a coach who has back-to-back lessons, planning, competitions to run and a pro-shop to manage, time is everything. Once we receive a player's assessment, we create a report that can be handed to or emailed to a parent. 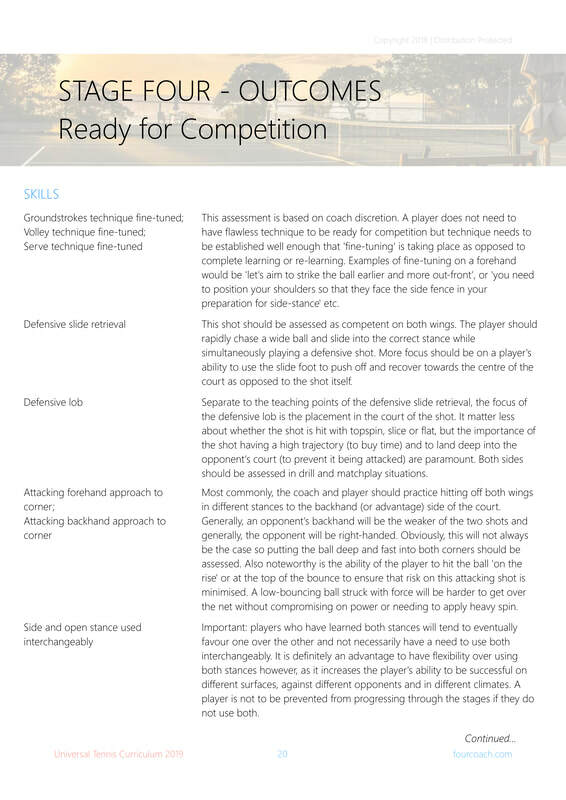 This report also serves as a helpful tool for the coach's focus for upcoming lessons. We do not plaster our logo onto the report. We use yours, or none at all. 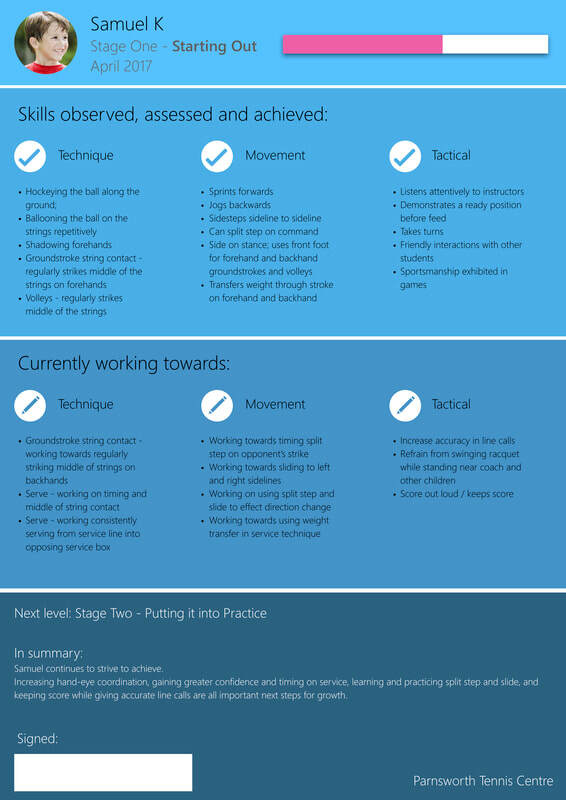 It is important for the parent to know that the assessment and report are overseen by the coach and tennis centre. Also, we do not collect a database of student/parent email addresses. All reports are sent directly to you, the coach. Also, this is an opt in/out system. No contracts, subscriptions or minimum spend. Click the button below to get in contact for more information. Whether you're looking for competition and tournament concepts and ideas that support a range of abilities or for remotely managed competitions, FourCoach has a range for you to consider. 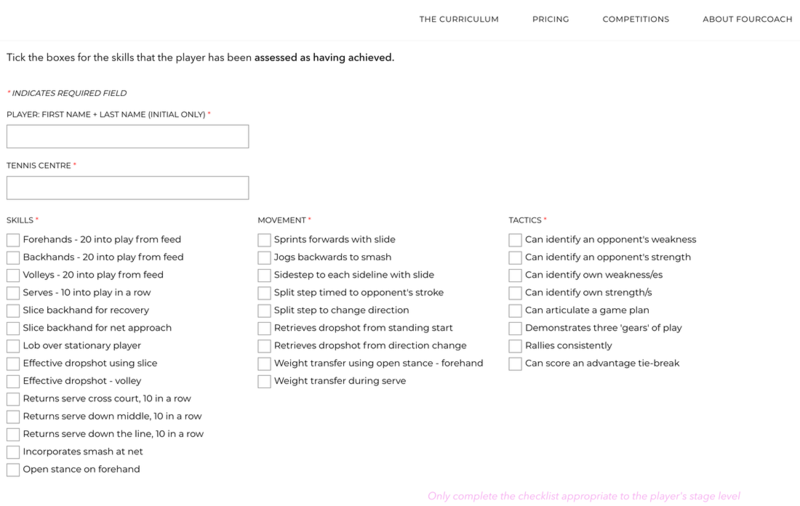 Where applicable, FourCoach will utilise the assessed abilities of each player and group accordingly so that competitions do not have large disparities between the strongest and weakest players. 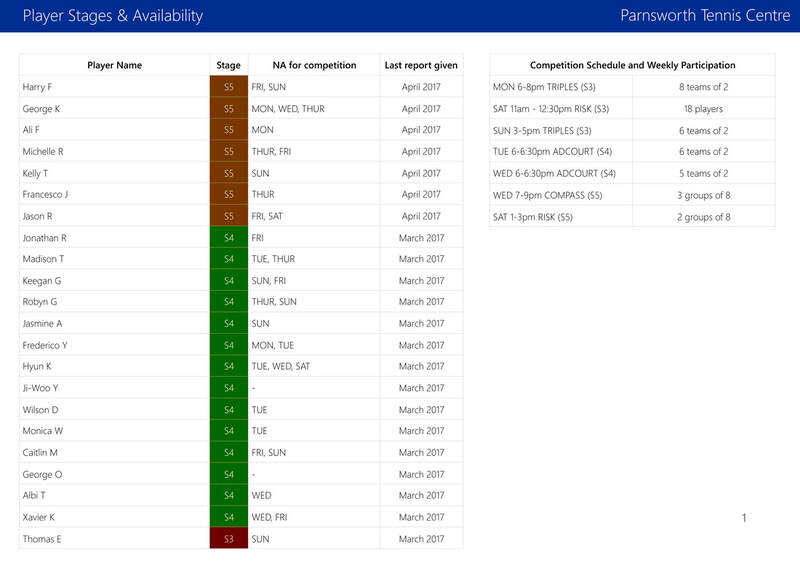 Additionally, FourCoach can update rankings, formulate competition and tournament draws, flexibly group players and provide printable resources for coaches to save time and effort. A typical group coaching student will pay between $100 - $180 per term and a student in private coaching between $500 - $800 per term. A term report written by a real-life tennis coach (and not generated by some computer program or bot) will cost between $4 - $6. This means that with an increase to a student's term fees of 40c - 60c per week, this report will not be an added expense. What is client loyalty and increased player development worth to your business? * Note: the prices below are now updated to reflect 2019 pricing. * Note: you may have three students who you want reports written for, or you may want reports for all 137 of your players. Either is fine with us.